The suit asks to push certification off to Wednesday and to require acceptance of all absentee and provisional ballots as defined by a 2010 Georgia law. The battle for the Georgia Governor's Mansion is still up in the air and the race is tightening even more. 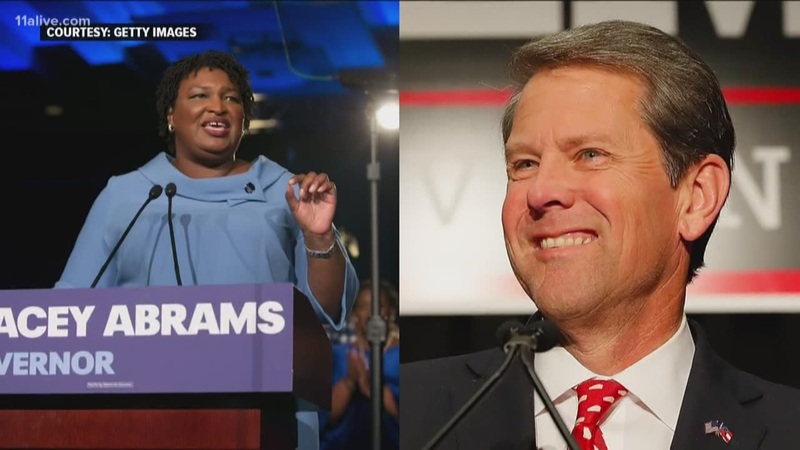 Republican Brian Kemp declared himself the winner of the race and has started to craft a transition team, but Democratic challenger Stacey Abrams said she will not concede the race until each vote has been counted. The latest numbers indicate that Kemp's lead has dropped to 50.28 percent of the vote as of Monday morning. He needs to have 50 percent plus one vote once all votes have been tallied to avoid a runoff in the election. One reason the numbers have kept changing is that provisional ballots have continued to be certified since last week's election. On Sunday, Abrams filed a federal class-action lawsuit seeking to force a delay of the official certification of the governor's contest from Tuesday, Nov. 13, to Wednesday, Nov. 14, which they say would allow all ballots to be counted. In addition, the suit seeks to require county registrars to accept absentee and provisional ballots as defined by procedures set forth in the 2010 Georgia law describing the accounting for provisional ballots (O.C.G.A. § 21-2-419). "This race is not over," representatives vowed. "It remains too close to call." The lawsuit names DeKalb County, Gwinnett County and Kemp, personally -- who, until last week, was Georgia's Secretary of State and in charge of overseeing the state's elective process. Kemp stepped down from that post on Nov. 8 during a joint news conference with current Gov. Nathan Deal, during which Kemp named his transition team. "It's incredibly shameful that liberal lawyers are doubling down on lawsuits desperately trying to create more votes for Stacey Abrams," Kemp campaign representative Brian Mahoney said on Sunday. "They don't want to win this election. They are trying to steal it." Representatives for Abrams said Sunday evening that she is holding out because they claim there is no way to know how many ballots still have yet to be counted since counties are not accurately reporting every ballot that comes in. They claimed that Gwinnett and DeKalb counties were rejecting any ballot that had any sort of irregularity on them -- including errors as small as putting the current date on the "date line" as opposed to the voter's birth date. They also pointed at Chatham County, where there were claims of a large discrepancy between the number of people who say they requested absentee ballots and those who actually voted. According to the lawsuit, the Fulton County Board of Registration and Elections has reported rejection 1,556 provisional ballots -- 1,000 of those due to being cast by voters whose registration records reflected a county other than Fulton. In Cobb County, election officials said they plan to certify their counts by noon Monday after working through the weekend to review provisional and overseas ballots. The situation surrounding the Georgia governor's controversy does not sit well with President Donald Trump. On Friday, the president got involved in the debate via Twitter. "You mean they are just now finding votes in Florida and Georgia -- but the Election was on Tuesday? Let's blame the Russians and demand an immediate apology from President Putin!" Trump tweeted. Kemp and his team fired a further salvo over the weekend. On his campaign's social media page, Kemp said that based on the current numbers, it is "mathematically impossible" for Abrams to force a runoff or to win the race. By Georgia law, any candidate in any election must receive 50 percent of all votes cast, plus one vote to be named the winner of that election. If that does not happen for any single candidate in that race, the top two vote-getters in that race will proceed to a runoff election. Once the vote is certified, there will be an answer for the governor's race. There will be a runoff for the Georgia Secretary of State's office, vacated by Brian Kemp. The polls will be open statewide on Tuesday, Dec. 4. Republican Brad Raffensberger and Democrat John Barrow will be on the ticket for that office. There are other local offices in some communities that also face runoffs on that date. And yes, there will be early voting before the runoff election -- but for a much shorter period than there was before the general election. The week prior to the runoff election -- Nov. 26 to Nov. 30 -- there will be early voting available across Georgia, though details have not been released by most counties yet. Any lawsuits tied to the governor's election can change any of those dates for a runoff election.